People have used Epsom salts since ancient times for many purposes that range from gardening to maintaining overall health. But, despite its name, Epsom salt is nothing like salt. It is a compound consisting of magnesium and sulfate that occurs naturally. It got its popular name from the saline spring at Epsom in Surrey, England. A simple glance at its components — magnesium and sulfates — will help you understand better why it is so widely used. Magnesium regulates about 300 enzymes essential for a proper functioning body. Magnesium deficiency increases blood pressure, causes hyperactivity, heart problems, and other serious health conditions. Sulfates participate in many biological processes, including the elimination of toxins and the production of certain proteins. In this article we give you 20 uses of Epsom salt. Start using it today and enjoy its benefits. Experts have confirmed that increased magnesium levels strengthen heart and cardiovascular vessels by stimulating the circulation and decreasing the blood pressure. Magnesium also helps your brain use insulin better. It also sustains the calcium level in your organism. You cannot get sulphates from food, but you can sure absorb them through your skin. Sulphates stimulate the production of digestive enzymes in the pancreas and cleanse your body. Epsom salt removes toxins and heavy metals from cells, relieving muscle pain and helping your body to flush any harmful material out. Epsom salt can really help you flush toxins out of your organism. Its magnesium detoxifies cells efficiently. It can also help you purify your body of environmental contaminants that affect your health. Make yourself a nice and relaxing detox bath. Fill your bathtub with warm water and stir in 1-2 cups od Epsom salt. Soak in for 10-15 minutes. You can pamper yourself 2-3 times a week. Use Epsom salt to fade bruises. Soak a washcloth in some cold Epsom salt solution — 2 tablespoons per cup — and apply the compress on your skin. Epsom salt soothes sunburned skin. Use it every time you spend too much time on the beach. It has strong anti-inflammatory properties that can alleviate mild sunburn irritations, including itchiness and pain. Epsom salt can help you maintain an even skin tone. – For sunburned hands and legs, dissolve 2 tablespoons of Epsom salt in a cup of water. Keep the solution in a spray bottle and spray the affected area every time you need it. Leave the solution on for 10 minutes, and take a shower. Repeat this treatment several times a week for optimal results. – You can also fill your bathtub with lukewarm water and stir in a cup of Epsom salt. Add some lavender essential oil and soak in for about 20 minutes. Epsom salt is the best solution for you if you seek for a natural insect repellent. Spray some Epsom salt on the lawn to control insects. This will not damage the grass and it is completely safe and toxic-free. You can also sprinkle some dry Epsom salt to get rid of any slugs and snails. Some plants and herbs really like Epsom salt. 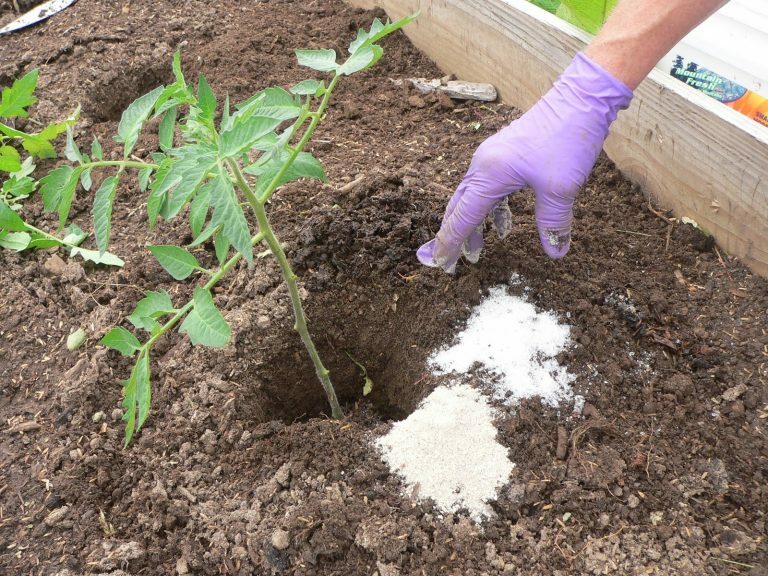 Put some Epsom salt in the soil around your plants to make them happy. This works great during blooming season, and the plants will give you the most beautiful and long-lasting flowers. Roses, tomatoes, palm trees and peppers are the top fans of Epsom salt! Gently rub your skin using some Epsom salt after your shower. This will help you remove any dead skin cells, and your skin will be super soft and smooth. Stir a quarter cup of Epsom salt in a cup of warm water. Let the solution cool in your fridge. Use a cotton pad to apply it to any bug bites. This will soothe your pain and itching. As the Epsom Salt Council says, Epsom salt has the ability to increase the osmotic pressure on the skin, and thus draw any foreign bodies toward the surface. Dissolve a cup of Epsom salt in your bathtub and soak the affected area. 1-2 tablespoons of Epsom salt per gallon of water are quite enough to nourish the plants in your home. The popular Epsom salt detox bath is traditionally used to relieve muscle pain and stiffness. Epsom salt flushes out toxins and waste material from the body and the digestive tract. It is commonly used as a laxative, meaning it works great in cases of constipation. Dissolve 1-2 tablespoons of Epsom salt in a cup of warm water and drink the solution before you eat or drink anything. Drink it once a day. But, be careful, oral application of Epsom salt may cause gastrointestinal irritation, diarrhea, nausea, and even vomiting. Always consult your doctor before you take Epsom salt.Never consume it longer than a week. Soaking in Epsom salt bath reduces water retention and bloating. Hot Epsom salt bath is an excellent remedy for colds. It helps your body fight off infections easily and recover faster. Epsom salt is known for its ability to relax the body and provide a better sleep. Hot Epsom salt baths in the evening, an hour before bedtime, can do miracles. This will increase the magnesium level in your body. Magnesium deficiency causes fatigue, stress, heart diseases and joint pain. Fill your bathtub with warm water and stir in a cup of Epsom salt and a cup of baking soda. Soak in and enjoy. Warm Epsom salt foot baths are great if you need to get rid of unpleasant odor, pain or feeling of heavy legs. 15-20 minutes will improve your circulation, reduce any inflammation and soften your skin. Have you overcooked your food? Scrub out your cookware using a few tablespoons of Epsom salt, some soap, and hot water. This will remove any burnt food easily. Sprinkle a few tablespoons of Epsom salt at the base of your plants. This will keep them healthy and maximize the yield. Epsom salt regulates electrolytes. Calcium is the main conductor for electrical current in human body, and magnesium maintains proper calcium levels in blood. These are quite difficult to get through the food, but you can still absorb them through the skin. Medical research has shown that sulfates are of essential importance for the formation of brain tissue, joint protein and mucin protein that lines the walls in the digestive tract. Sulfates help the pancreas to generate digestive enzymes and purify the body from medicine residues and environmental contaminants. Sulfates are essential for the formation of brain tissue, joint protein, and they also stimulate the pancreas function and mucin protein.